NanoWorld Pointprobe® ZEILR probes are designed for owners of the Zeiss Veritekt or a Seiko Instruments microscope using the contact mode. Compared to the Pointprobe® contact mode probes of the CONT type the force constant is slightly increased. The probes of the Pointprobe® series are made from monolithic silicon which is highly doped to dissipate static charge. They are chemically inert and offer a high mechanical Q-factor for high sensitivity. 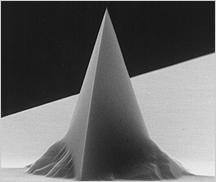 The tip is shaped like a polygon based pyramid with a height of 10 - 15 µm.